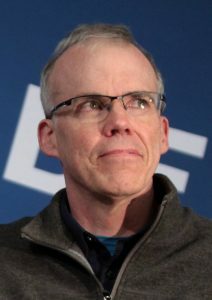 Bill McKibben (p.1960) is a journalist, environmentalist, and activist; Distinguished Scholar at Middlebury College in Vermont, and founder (2007) and Senior Advisor of 350.org, a planet-wide climate change movement that claims to have organized 5,200 rallies in 181 countries, to warn that 350ppm of CO2 in the atmosphere (now over 400ppm) is the safe upper limit. He also organized Step It Up (2007) to demand action for global warming, and the People’s Climate March (2014). He has published many articles and >15 books, including The End of Nature (1989, translated into 24 languages), The Age of Missing Information (1992, on loss of meaningful content), Enough: Staying Human in an Engineered Age (2003), Fight Global Warming Now (2007), Deep Economy: The Wealth of Communities and the Durable Future (2007), Eaarth: Making a Life on a Tough New Planet (2010), The Global Warming Reader (2011), and Radio Free Vermont: A Fable of Resistance (2017; a novel). He has written for The New Yorker, National Geographic, Rolling Stone, Harper’s, Adirondack Life, and other magazines. McKibbon has been honored by the Puffin/National Prize (2010), Gandhi Peace Award (2013), Sophie Prize for sustainable development (2014), Right Livelihood Award (2014) and more. Foreign Policy, The Boston Globe, and Time magazine have included him in their lists of most influential people.